Our Capacity Building programmes in stakeholder collaboration and collective leadership integrate knowledge building, personal mastery and the actual work reality of participants. We offer open seminars, on-site course and tailor-made courses. Based on key conceptual content our capacity building programme incorporates the actual work reality of participants. We strive to deliver knowledge that can be implemented in day to day business. Participant’s feedback helps us to continuously improve. Our Transformation Support for cross-sector collaboration projects combines advisory and capacity building: this way we enable people to develop their own competence according to their specific challenges. Our Collective Leadership Academies Network trains facilitators from different sectors worldwide and fosters change in thinking and practical implementation through knowledge building, reflection and exposure. Our Research is designed as a learning process for sustainability helping people move quicker towards new action. Our Collaboration Projects are piloting new approaches to cross-sector learning and engagement for sustainability. Our vision is to empower future-oriented people to lead collectively towards a sustainable future. Sustainability is a truly global issue. How well we meet that challenge, success and failure in moving towards a more sustainable way of living, affects everybody. We believe in the principle of cooperation and collectively created solutions – across sectors, institutions, nations, and cultures. With our Capacity Building Programmes, our Transformation Support, our Collective Leadership Academies Network, and our Research, we build competence for sustainability. We empower leaders who anchor their action in the concern for the greater good and the future of humankind on this planet – for responsible business, people-oriented public service, and a strong civil society. We build a global community for change by activating networks and fostering mutual support among change agents. We empower people globally to use our methodology of dialogic change and collective leadership for sustainability. WHOLENESS: Opening up to see the world as a whole and acting for the common-good. Transformative Designs for Sustainability – Facilitating mindshifts for collective action and Anthropocene prosperity- Symposium, Hannover 2018. Fostering economic development, addressing climate change, ensuring food security, meeting health challenges, enhancing good governance, ensuring responsible supply chains, and improving natural resource management are complex challenges that can only be effectively addressed through robust collaboration among a wide range of stakeholders and institutions with different interests, viewpoints, and competences. These and other sustainability challenges require building functional multi-actor collaboration ecosystems that can deliver results. Leadership in navigating such complex challenges depends on the capacity of a collective to catalyse and implement change for the common good. Up-scaling collaboration skills globally is the Collective Leadership Institute’s passion – for responsible business, people-oriented public service, and a strong civil society. • build competence to transform systems towards sustainability. Achieving impact in a multi-actor setting requires expertise in how to make collaboration work. Learning a tested methodology and using a common language for complex collaborative change empowers people to make change happen faster – across institutions, stakeholder groups, and societal sectors. Results are more easily achieved and become more resilient. • helping to shift multi-actor settings towards successful collective action. Our core approach is building functioning collaboration ecosystems by creating a culture of collective leadership. 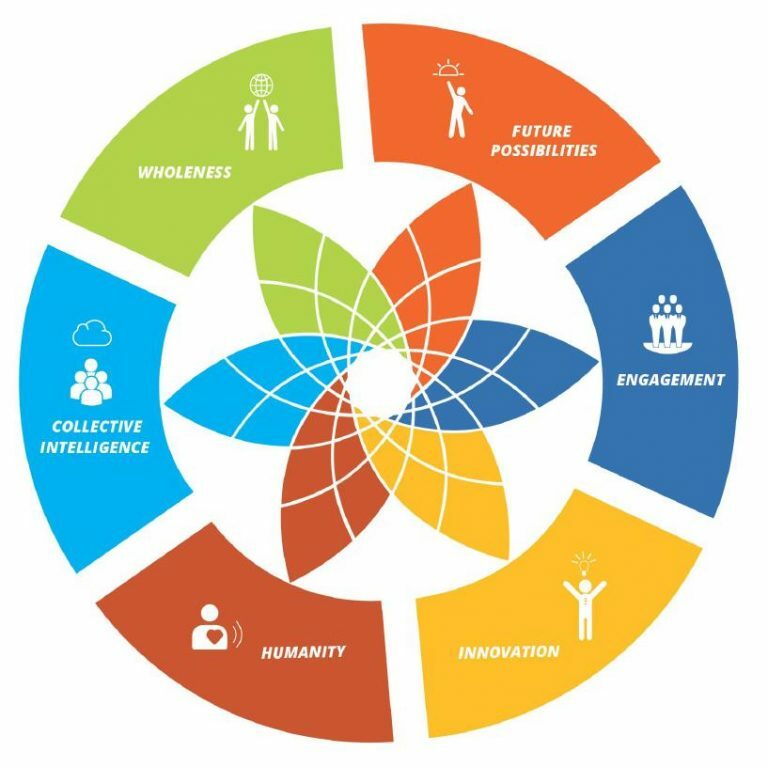 Our methodologies, based on our Collective Leadership Compass, focus on invigorating human interaction and networks to drive transition processes and help plan, enact, and assess collaborative change. They strengthen individual leadership, enhance the leadership capacity of a collective, and shift organisations or systems of collaborating actors towards better co-creation. We see ourselves as partners of organisations, leaders, change agents, networks and multi-stakeholder action groups who – like us – are driving a paradigm shift towards sustainability. Our role is building competence for collaboration in complex change. We help drive a global agenda that shows that the quality of collaboration has a direct impact on results on the ground. • Mission-driven: as an international non-profit organisation we strive for global impact as we know that the Sustainable Development Goals can only be achieved with more effective cross-sector partnerships, international multistakeholder alliances, and citizen engagement in societal change. as on in-depth research on well-functioning collaboration ecosystems. Founded in 2005 with offices in Germany, South Africa, and the United States, CLI is an international non-profit organisation with the mission to scale up collaboration skills for a sustainable future. Our capacity building approach empowers people and organisations to address sustainability challenges successfully with a focus on high quality stakeholder collaboration, dialogic change, and collective leadership. More than 3500 alumni of our programmes and more than 35 successfully supported projects showcase our experience in helping to shift multi-actor collaboration to deliver tangible results. Thanks to our proven methodologies, excellent reputation and achieved impact, the Collective Leadership Institute is one of the world’s leading mission-driven organisations in the field of making collaboration for sustainability work. We look forward to partnering with you to achieve your mission and enhance global and local sustainability efforts. With our Collective Leadership Academy, our Transformation Support, our Network Building, and our Research we empower people to lead collectively towards a sustainable future – for responsible business, people-oriented public service. and a strong civil society.